In Today’s update you will find a new game mode called Least Played. In this mode, players can only pick from their least played heroes. Having an even playing field for everyone in the match will hopefully encourage players to break out of their comfort zone and try new heroes. Give it a shot! We’ve also changed the Shared Content panel. 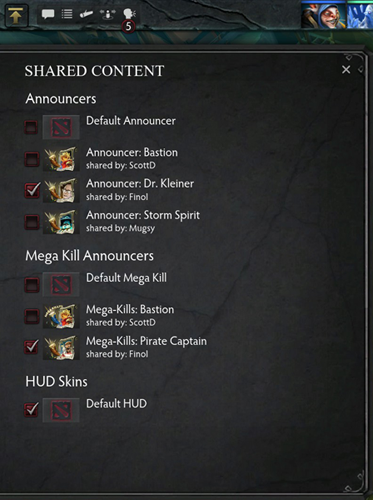 Some items in Dota 2 can be shared and used by other players in a match. The new panel should make it easier to browse the available shared items and help you be the coolest kid in town when everyone picks yours. In other news, we recently saw game number 100,000,000 played. With over 3 million unique players every month, the Dota 2 community is blossoming into a beautiful flower.